Mounted Points facilitate safe sheet metal fabrication. Designed for edge-breaking stainless steel sheet metal, Rex-CutÂ® Mounted Points includeÂ non-woven A54GFX Cotton Fiber type which leaves smooth finish, and W222 Medium Rubber version that produces finer finish. Both are self-dressing to workpiece and permit safe handling and fabrication by workers.Â Products are available in 1 x 2 in. size as well as several other sizes. Two types of mounted points that are designed for edge-breaking stainless steel sheet metal to permit safer handling and fabrication by workers are being introduced by Rex-Cut Abrasives of Fall River, Massachusetts. Rex-Cut® Mounted Points for Stainless Steel Edge-Breaking include a non-woven cotton fiber type which leaves a smooth finish and a rubber version that produces a finer finish. Both are self-dressing to the workpiece and help make it safer for workers who handle stainless steel sheet metal. Simply run over the edge of the sheet metal, Rex-Cut® Mounted Points for Stainless Steel Edge-Breaking include the A54GFX Cotton Fiber type which is more aggressive than the W222 Medium Rubber. Available in a 1” x 2” size for this application, they are also offered in several other sizes. 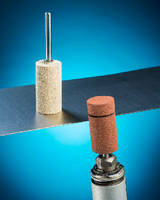 Rex-Cut® Mounted Points for Stainless Steel Edge-Breaking are priced according to type and quantity. Free samples are available upon request.